When I first noticed this, I thought that birds were smart. Up until last Fall w had a cat that lived on our back porch. The cat has since moved onto the big litter box in the sky. I thought the birds were smart because they noticed this, therefor thinking it was ok to make a nest on our back porch. 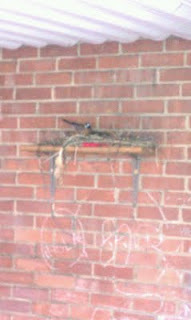 It's not the best picture, but it was the only one I could get of the bird in it's nest. In case you can't tell, that's a robin. I her they're supposed to bring luck. I hope so! For a few days I watched the nest being built. I could see the birds flying past our dining room window to the shelf on the wall. If I stood far enough back in the yard, they would be daring enough to build while I watched. Just when I thought these birds were smart, they blew my theory right out of the water. 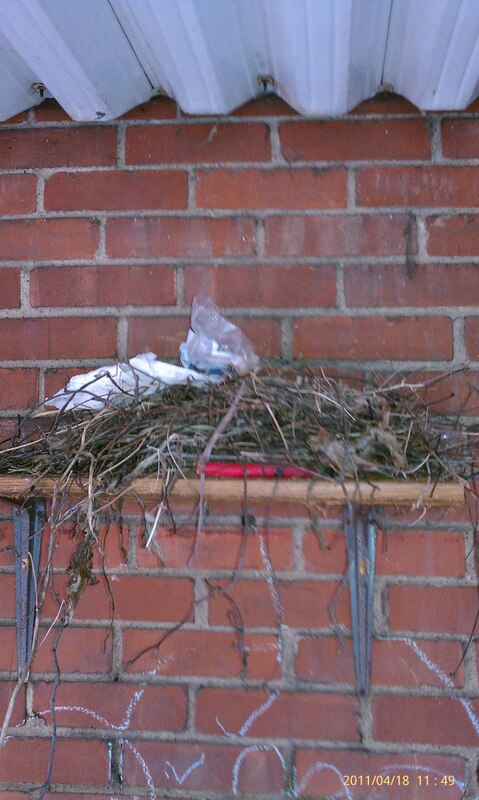 This is the most recent picture of the monstrosity of a nest. 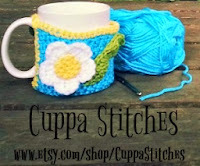 It's actually a little bigger than this, if you can believe that. Yes, that is a plastic wrapper up in there. Probably not safe! I didn't dare mess with the nest. Thankfully the plastic wrapper fell out. The dryer sheet? Not so much! To further prove my "birds are actually dumb" theory, I would also like to point out that right before this picture was taken, one of the robins delivering more twigs (like there aren't enough up there already) completely missed it's landing point. Instead of the nest, it flew smack into my dining room window. Smooth, bird. Real smooth! Monday, I noticed two robins flying close to our house. I went out several times to try and see where they were trying to build a nest. The kids play on that side of the house, but their was no nest to be seen yet. It stormed all Monday evening straight through Tuesday afternoon (flooding type of rain mixed with lightening and thunder). When we finally got a pass in the rain, about 3pm Tuesday, I see the robins outside. I go outside to see if I can find the nest. It is on a light fixture right outside our side door. The thing is huge. I'm thinking they were in a hurry because they had to of been working on it the entire time it was storming. 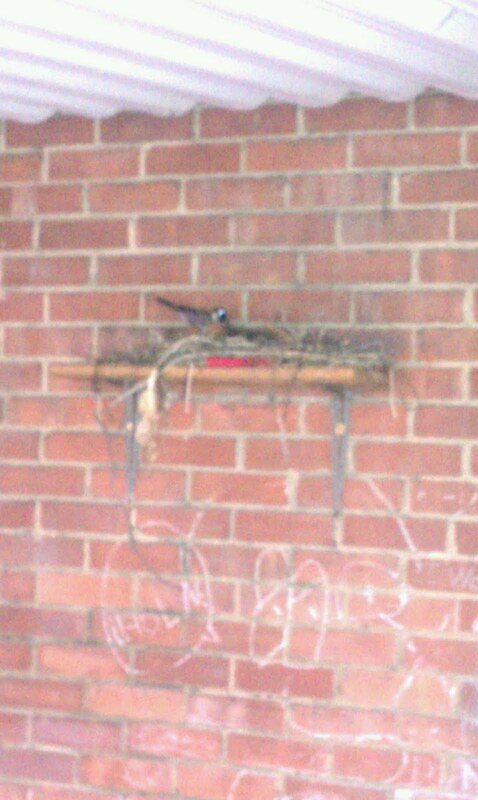 Not sure it is smart to build a nest in storms, but at least they know it will hold up to the extreme weather. Now to see if they can survive our dog. Have I mentioned that I hate birds? Like really hate them? I would be freaking out if they were building a nest on my back porch. All of that would be gone. Growing up, we had a large picture window in the front of our house. The birds would eat the poison berries on our bushes and then get drunk and smack into our window, breaking their necks or their wings. Then my dad or brothers would have to shoot them. Eek. The only birds we ever get are pigeons. I hate them. Occasionally we'll see sparrows, but not often. You washed the window with Windex didn't you.. I just saw a robin today trying to pull a tied piece of string off an old tomato cage. They are like scavengers! Ohmygosh, that is so funny! Real life confession: i am terrified of birds! If one flew into my window, i'm pretty sure i would pass out!